At our office we have an ultimaker 2 installed, we have it now for some weeks and already printed out a bunch of stuff. It's cool to see, amazed by the technology. Expect the manner to start a print job, you have to save your generated gcode files onto an SD card, stick it into the ultimaker and use the rather simple menu from the tiny display to start the print job. The time of a print job is rather long depending on the object you want to print, so many times you got up and went seeing if everything went alright, so quickly distracted.. This sounds really crazy for such a piece of high tech technology and therefore I did a bit research on the web for a nice remote web interface. I first started by installing the octoprint manually on a raspbian distribution. But it took really long, I mean REALLY long so I downloaded the preconfigured image, maintained by Guy Sheffer, and installed it on a 4GB SD card. I did some tweaks on the raspbian distribution, configured a for the pi user, disabled root login for the ssh service, updated the whole distribution and configured the wlan0 interface to connect wireless. We also bought a camera module which is discovered automatically by octoprint. 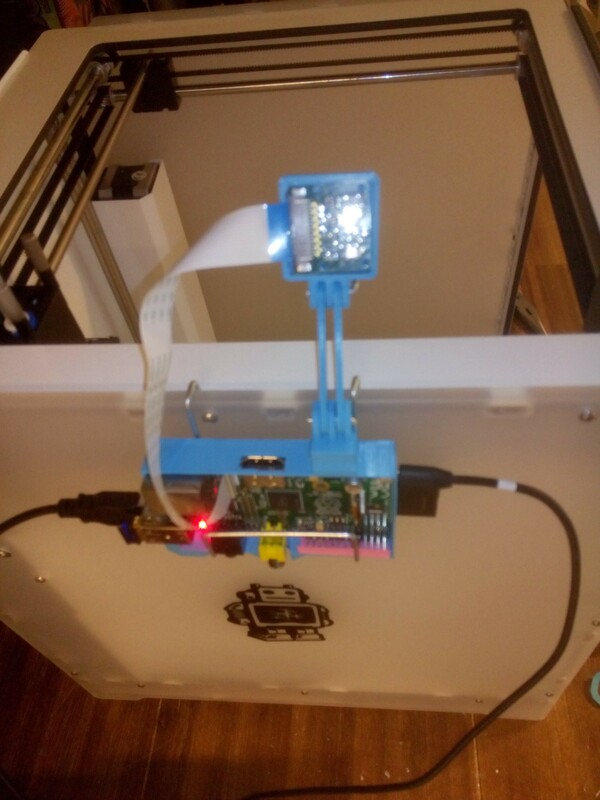 Once you've connected the hardware as described in the movie and booted the raspberry the camera is immediately picked up by the octoprint service. So therefore you can't connect to the hardware when testing out raspistill and others to test the cam. You should be able to catch the output of the mjpeg-streamer on port 8080 of the raspberry. 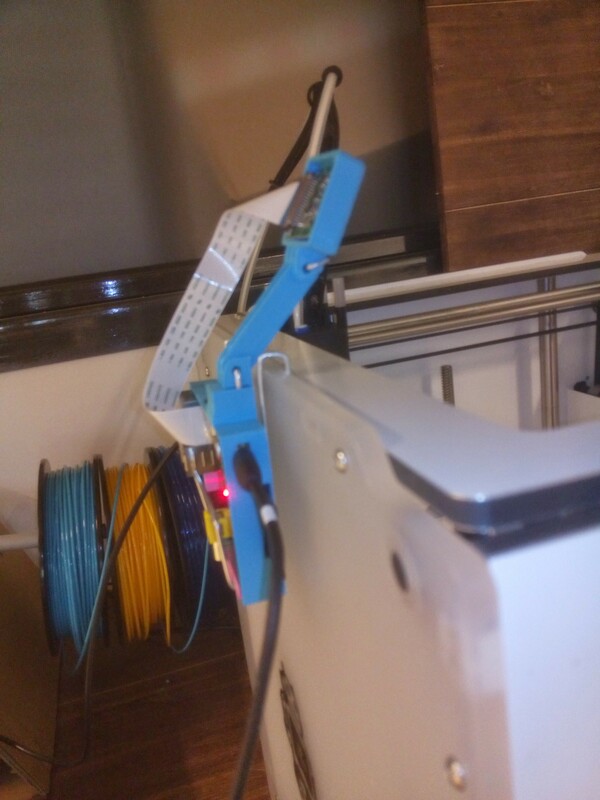 Normally the raspberry should connect using those settings automatically at startup to the ultimaker as you could configure in the settings page of octoprint. You can look on for example thingiverse for source files of objects you want to print. (the .stl files). Which you have to slice using cura. Be aware you set the machine settings of the cura to reprap (File -> Machine Settings -> GCodeFlavor -> RepRap (Marlin/Sprinter) ) so the octoprint engine can process your saved gcode files. 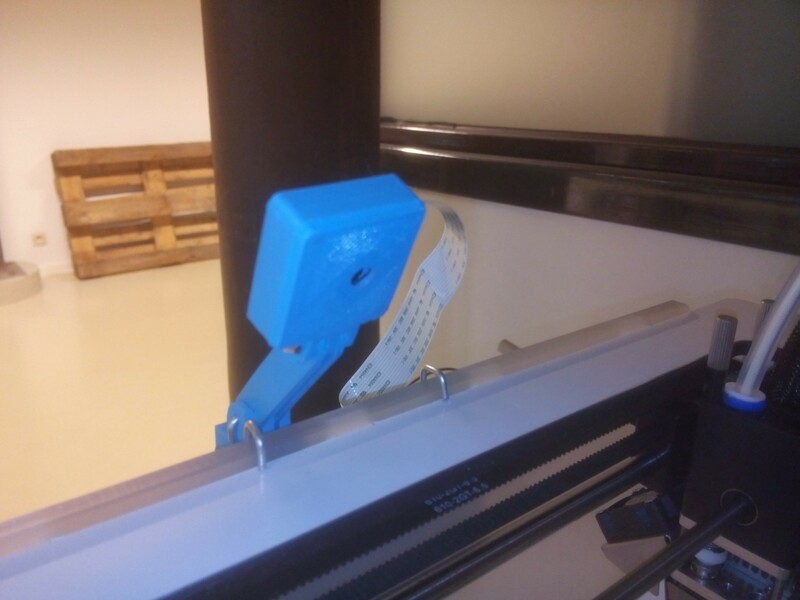 Once you've saved your gcode file you need to upload it using the octoprint webpage. After the upload is complete you can search your project in the Files section and click on the little printer icon on the right of the name. You should see the temperature of the head is increasing to 220 degrees followed by the bed temperature of 70 degrees. Once the ultimaker is warmed up your print will start. And you should see the progress of it in the octoprint interface.